In the following guide, you will get more familiar with the Analytics section of the InPlayer Dashboard. The Analytics section is the first thing you see when you log into your InPlayer dashboard. 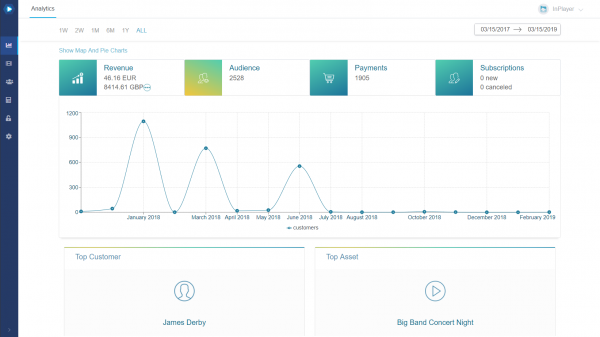 Here, you can see a visual overview of your revenue, customers, payments, and subscriptions. The overview can be displayed as a Line Graph, a Pie Chart, or a Global Map showing the customer activity in different countries. To show the line graph for any of those parameters, simply click on one of them. Further down the page, you will see a record of your top customer, i.e. the customer with most payments, as well as your top asset, i.e. s the asset that had the highest number of purchases. Further down still, you can see a list of your top 5 customers, as well as your top 5 assets.